This is a Pickerel Creek phenology post. High temp today – 16ºF, quite cold when the wind is in your face! This photo is from Monday, the day before our freak thaw ended. The creek is no longer open like this. 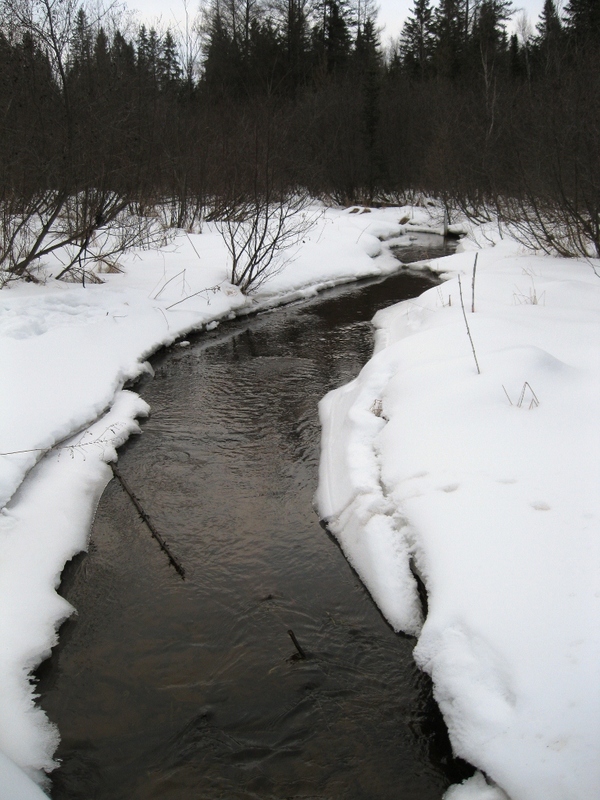 Yesterday it was covered with a delicate layer of ice, and today the ice was blanketed under fresh snow, so that in spots the creek itself was all but invisible. 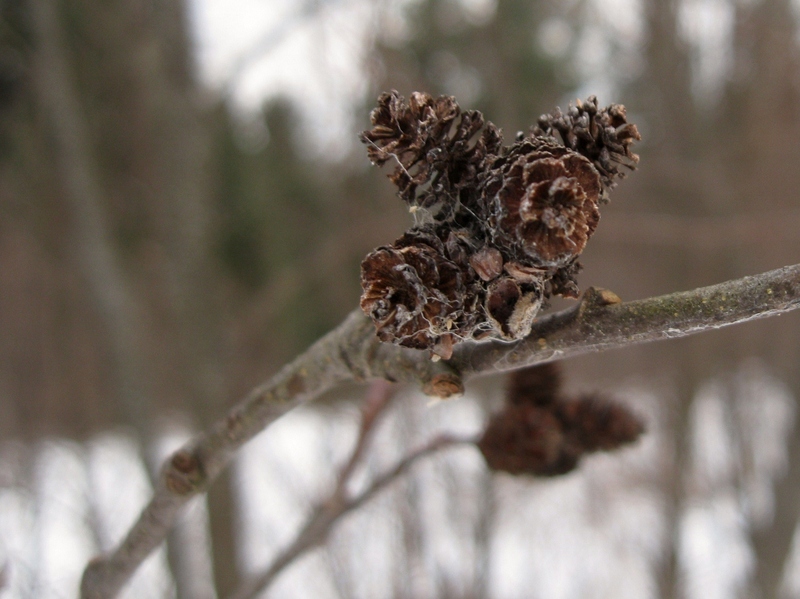 The small, shrubby trees you can see along the creek banks are alders, Alnus sp. 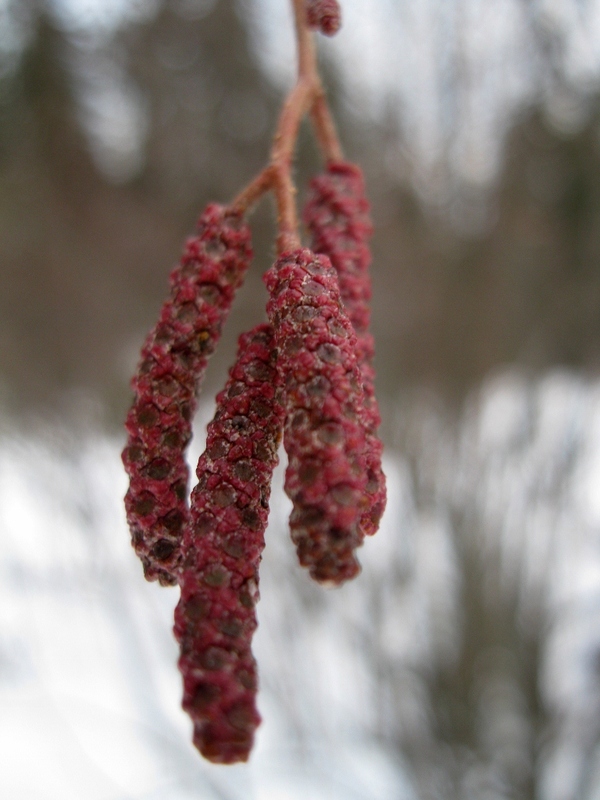 Even in winter their reproductive parts, the pollen-bearing catkins and cone-like fruit clusters, make them instantly identifiable. After the unseasonably warm weather last week, I haven’t adjusted to the cold again yet – I was surprised by how quickly my fingers started to hurt if I took my mittens off outside this afternoon. The groundhogs here must have seen their shadows last week, because winter isn’t gone just yet. Yeeks, makes me cold to look at that snowy stream! No snow here in the PNW, except up in the mountains. We’ve got flowers poking their little heads out of the soil already. Funny how it almost looks colder when you can see the water flowing through the snow (as opposed to when the stream is iced over)! Yeah, the flowing water somehow makes me think of my boots getting wet and that is never a warming experience. I love the catkin picture!